Joseph Caldwell, 1773-1835 The Numbers of Carlton, Addressed to the People of North Carolina, on a Central Rail-Road Through the State. The Rights of Freemen is an Open Trade. 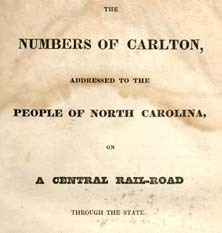 The Numbers of Carlton, Addressed to the People of North Carolina, on a Central Rail-Road Through the State. The Rights of Freemen is an Open Trade. Public works -- Economic aspects -- North Carolina. Railroads -- Early works to 1850. Railroads -- Economic aspects -- North Carolina.